Some Troops rotate to several BSA summer camps over the years. But Troop 890 is not “some” Troop. Logistically, it is supremely challenging to take 80-90 boys and 15-25 adults to summer camp just anywhere. Many camps can’t support a Troop our size. 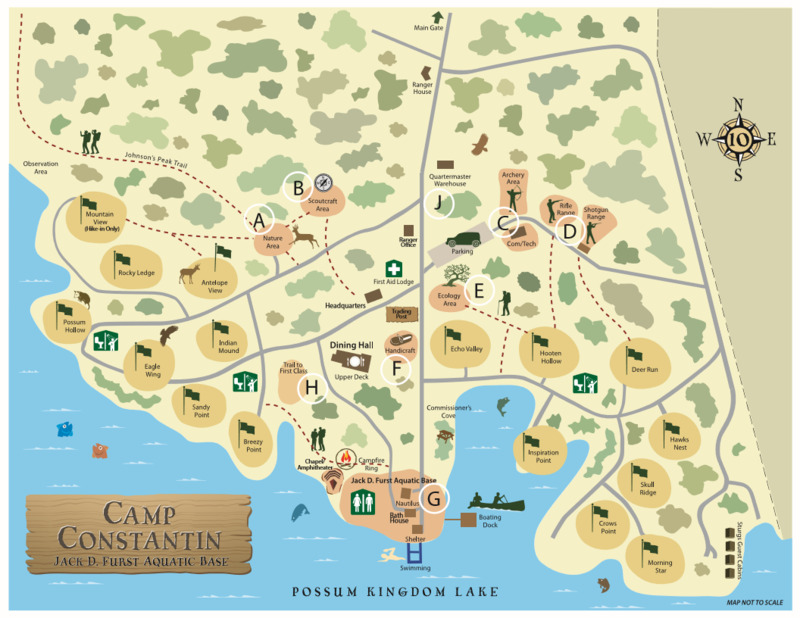 So, Troop 890 has made Camp Constantin our home away from home. For over 40 summers in a row, we have invaded Constantin the 3rd week in June. We are big. We are loud. We have flamingoes. We have fun. We conquer the heat. Our First Years participate in the Brazos Buccaneers program which, in the mornings, helps them cover many of the skills needed for their early advancements. Each afternoon, instead of sending our First Years — which tend to be a group of 20-30 boys — to the camp merit badge sessions, our own adults hold private classes for the Swimming and Canoeing Merit Badges only for our boys. This system makes sure that our boys get sufficient water and teaching time, and we usually have a 100% completion rate as a result. On Wednesday or Thursday, the First Years hike up Johnson’s Peak and sleep under the stars. We have many traditions which continue to evolve over the years. Flamingos, chants/yells, and swagger are a big part of our fun and Scout-spirited week. Boys in their 2nd, 3rd, etc., years at camp take merit badges to help with rank advancement, leaving time for hanging out, napping, swimming, boating, playing Fat Bat, etc. We have 3 campsites each summer, with the First Years being in Indian Mound, the Second and Third Years in Eagle Wing, and the high schoolers in Sandy Point.